Glycerine for Soft Skin and Hair! Glycerine is an organic compound produced by a mixture of water and vegetable oil. It is a very useful ingredient for many home remedies. Glycerine is also used in many beauty products. Glycerine is a humectant, which means it can absorb high levels of moisture or water. Hence, it finds its place in most hair and skin care products. Though it can be directly applied on skin in dry weather, using it on the hair directly can be a gooey mess. Curly hair definitely looks gorgeous when maintained properly and it is always a challenge for a girl with curly hair to maintain them. Since curly hair gets drier compared to other hair types, glycerine works as a good conditioner on them. Make a moisturising hair spray by mixing equal quantities of glycerine and water. Add a few drops of your favourite essential oil and spray it on your hair after showering. Glycerine is a very good ingredient for skin, especially in winter. Apart from moisturising, it maintains the health of skin cells. Glycerine improves the healing process and accelerates tissues and cells to repair themselves. Add one part of glycerine and one part of honey to two parts of milk or water. Add half teaspoon of oatmeal and make it into a thick paste. Apply this on the face and rinse off after twenty minutes to get clean and soft skin. Caution: Do not use undiluted glycerine on skin or hair. It will pull out moisture making your hair drier, frizzier and brittle. It may also make your skin blistered. 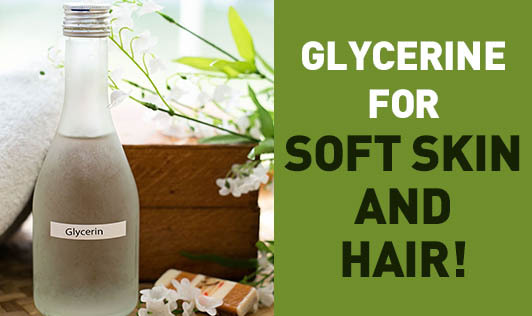 Though glycerine is a very useful beauty product, use it wisely to get the benefits.